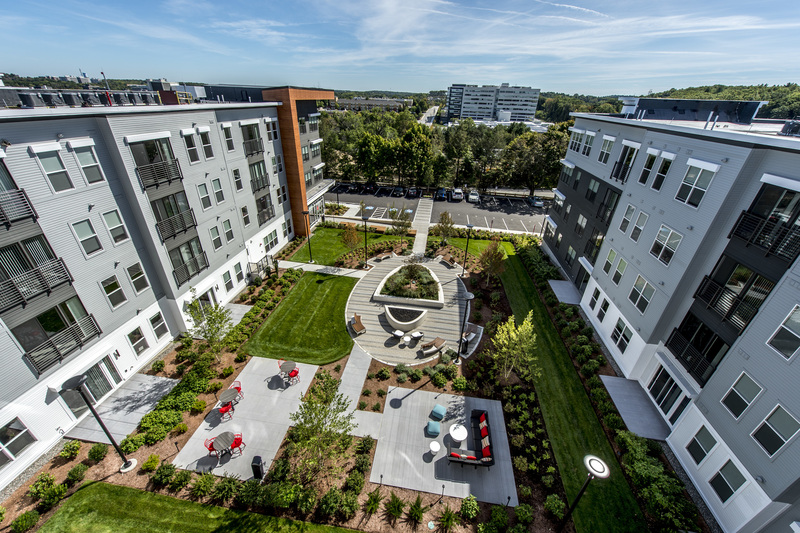 JLL Income Property Trust, an institutionally managed, daily NAV REIT (NASDAQ: ZIPTAX; ZIPTMX; ZIPIAX; ZIPIMX), today announced it formed a joint venture with Nordblom Company to invest in The Tremont and The Huntington apartment communities in Burlington, Massachusetts, 15 miles northwest of downtown Boston. Nordblom Company, a preeminent New England-based developer of Northwest Park, recently developed these two Class A apartments. Combined, the two communities total 297 units and are located in Northwest Park’s amenity-rich mixed-use development courting Boston’s highly educated millennial workforce. The Tremont and The Huntington apartment communities align well with JLL Income Property Trust’s apartment strategy, targeting suburban markets with highly rated schools and strong market fundamentals and demographics. Burlington is a 30 minute drive from downtown Boston, and is just off of I-95 and Route 3 providing easy access to “America’s Technology Highway” – the Route 128 corridor that hosts the largest concentration of tech jobs outside of Silicon Valley. The area boasts median household incomes within a 1-mile radius of over $110,000 and median home values within the zip code of over $530,000, making renting an attractive choice. The local high school is equally impressive, receiving an “A” grade from Niche.com and earning LaSalle Research’s Silver classification. At the hub of Northwest Park, these apartments are within walking distance of a Wegmans grocery store, over 20 restaurants, and a variety of other retailers, and are directly adjacent to the Burlington Mall, the second largest retail center in Massachusetts featuring more than 185 specialty shops. The Tremont and the Huntington are highly amenitized, luxury apartments designed to attract a renter by choice demographic, and feature hardwood flooring with carpet in bedrooms, quartz countertops with under-mount sinks in both kitchens and bathrooms, stainless steel appliances, soft close drawers, in-unit washer & dryer and nine foot ceilings. Community amenities include a tech lounge, community kitchen, pool tables, swimming pool, fitness center, yoga room, grilling patio, designated pet areas and covered parking. Nordblom Company is a real estate enterprise with a 90-year history of investing in and developing properties throughout the New England region and select markets across the country. Headquartered in Burlington, Massachusetts with offices in Brookline and Raleigh, Nordblom Company currently has 90 properties and in excess of $1 billion in assets under management. For more information, visit www.nordblom.com.